Tuesday lived brilliantly. She affected more people in her two short years than most people do in a lifetime. She is at peace. Tuesday taught me what strength, grace, and faith truly mean. Thank you Tuesday for bringing me closer to God. I will always feel honored to have known you. Please visit her mom's blog HERE and send them a prayer. Every Tuesday from now on will be her day on my blog. A permanent memorial for a child that touched us all. I hope my silence on that day will be a reminder to you all to say a prayer for her family. She truly is an angel. I know. I'm late. Yesterday was long and busy so I am just now ale to post. I wish I had better news. Tuesday is back in the hospital for a few days. She is starting to pass blood clots in her stool as a side effect of chemo. She is in alot of pain. They have stopped the chemo and started the transfusions. Pray that she feels better quickly. The good news is that her tumor is shrinking. It has lost the arm that was reaching up behind her heart and the main tumor has shrunk considerably. So the chemo/radiation is working. It just making her poor little body take such a beating. I am sure you are wishing you could help. Wondering what you can do. Well here is what you can do. 1. Pray. It is the most important thing you can do. 2. Read below to check out the fantastic fundraiser I have going from now until Valentine's Day. I think you will fall in love with these pendants and feel good knowing your purchase goes to the best cause around. .. I am so excited about this fundraiser. Last Sunday I was faithfully reading the blog, The Secret is in the Sauce and came across a giveaway by fellow SITSta, Happy Daisy for the most beautiful pendant necklace by Home Studio. I clicked on the link to Home Studio's etsy shop and fell in love. The pendants are just too cute. They transform wooden Scrabble tiles into something so hip and chic that I dare you to take a look at their shop and not buy something. Then an idea went through my brain. How cool would it be if they custom made a Tuesday pendant for us to buy? Something we could wear to show our support for Tuesday and her fight with neuroblastoma (if you are unfamiliar with Tuesday please click on the Tuesday label on the right side of my blog to read her story). I wrote to Home Studio figuring it was worth a try and was blown away by their response. Mark at Home Studio not only agreed to make a Tuesday pendant and reissue his twin pendant,but he also agreed to give 10% of all sales directly to Tuesday from now until February 14th!!!!!!!!!!! Is that amazing or what? A man who never even met Tuesday was generous enough to give such a gift. Keep in mind this applies to ALL sales on the website as long as you enter the words "for Tuesday" in the message section (its below the payment information right before you submit the order) of your order form. This is very important or else the sale won't go towards Tuesday's fundraiser . You can buy a Tuesday pendant and 40 other pendants for all your closest friends and as long as you write "for Tuesday" in the message section, 10% of your order goes right to them! The great thing about the pendants is that they are very affordable and shipping is minimal so they fit every budget. I know times are tight but I think everyone could find something they love, not spend alot, and feel good about the cause they are supporting. I will have the button on the left side of my blog that will take you directly to the shop from now until February 14th or you can click here. Please at least take a look and see if there is something that suits your liking. There is a little bald girl with a magic spirit who would appreciate it. Yesterday started out like any typical Saturday. We hit up Costco for a run of free samples (try the chicken parmesan meatballs. Yummy!) and the necessities. It was kinda rainy and we were feeling pretty lazy so we decided to start to head home after the smorgasbord. Suddenly the fog cleared from my brain and I let out an "Oh crap!" It was snow day and I completely forgotten all about it. We bought our tickets ahead of time for the 12:45-2:00 session. It was 1:30. But wait! They said if it rained they would move it to a later date and it had rained today so maybe we were okay. We drove by the park just to be sure. Not okay! There was snow in Lake Forest and we were missing it! We quickly drove home, emptied the car of perishables, grabbed our tickets, changed diapers, and I grabbed whatever snow proof items I could find in 30 seconds. Then we drove down the street ran for the snow. Sure Mari had a face covered in assorted Costco treats and Ben was wearing track pants instead of snow pants since I could find his in my 30 second clothes grabbing spree but we were there and ready to beg for mercy. Luckily the fabulous man in charge of the snow day listened to my whining and allowed us to trade in our tickets for the next session which began 2:30. So what if the snow was getting icy and the kids were past nap time. We were playing in the stinking snow! While we waited for our session to start the kids played in the snow play area designated for kids under 5. Ben absolutely loved the fact that he could turn the snow into balls and throw them. As you can see in this picture, I am not sure the girl behind him was quite as happy with his find. The girl to the right was a sitting duck. You have to keep your guard up in the snow kids! Finally our time on the sled hill came. Since my kids are evidently too good for a line they ran up and down the grassy portion of the hill while Mommy waited by herself. Then Paul and I tromped up the hill, sled in one hand, kid in the other. We got into position, said our prayers, and away we went. The kids loved it! Ben let out a cheer at the bottom of the hill and Mari turned to Daddy and asked for more. More? You want more? Well lets go! We slide down a few more times before Mommy's starvation and the overwhelming need to get the kids down for a nap took over. We waved goodbye to the snow and vowed to return next year. And we vowed that next time we will be on time. - Presale is open to Lake Forest residents for the first two days and nonresidents the third day. All tickets are presale. You can't buy tickets the day of the event. - Tickets are $5 and available at City Hall. - There are three sessions and the earlier you go the better because the snow is less icy. - They have bouncy houses, food, and a couple other little activities so you may want to bring a couple bucks with you. 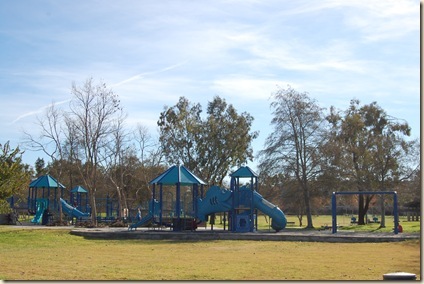 - There is a great playground at Pittsford Park your kids will love. Click here to see my post on Pittsford Park with pictures. 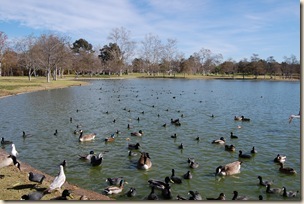 If you are ever cruising the 241 toll road in South Orange County, have I got a park for you! 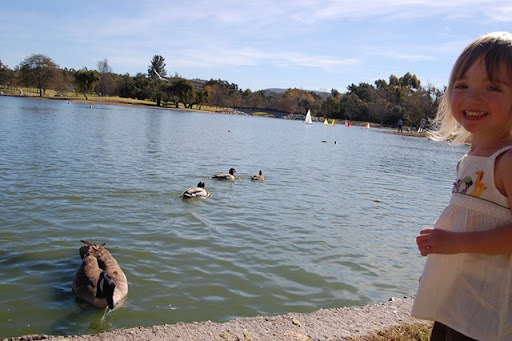 Its located in that short strip where Lake Forest, Mission Viejo, and Rancho Santa Margarita all bump into each other on Santa Margarita Pkwy and its the perfect place for your kids to jump out and stretch their legs. If you live in the area than run, don't walk to this little gem of a park. You want slides? Its got slides? You want swings? Oh yeah, its got swings. You want some weird contraption that can be best described as some kind of a stand up teeter totter. Well it has one of those too! Maybe I loved this park because the parents all kept a good eye on their kids so they didn't have a chance to become obnoxious monsters. Or maybe it was because it was oh so conveniently located off a main road but far away from traffic. Okay- its probably because it is the first place my son was ever asked by little boys to play with them and he actually played with them. Sure it was only for about 2 minutes and he really had no clue what he was doing but he tried! It took every ounce of my self control to not over to those two little boys, give them big hugs, and shout "bless you". If you don't know, Ben has severe sensory problems and rarely engages other young children so any time he does something social (playing next to kids but not with kids does NOT count) its a big deal to me. It gives me hope that he will be playing with all the other kids all the time one day. But enough of my touchy-feely moment, lets get to the details. There are play structures for all age ranges, softball and soccer/football fields, and a half court basketball area. Check it out! Note: Due to the already high demand (thank you! ), many people have told me they go to purchase something and it says sold out. If this is the case, scroll to the very bottom of the page and select contact seller and let him know what you want. He will email you back and make sure you get it! Scans, scans, scans. I am not so patiently waiting to hear results of scans. I think they were supposed to be today. Maybe yesterday. Maybe tomorrow. My brain is a giant fog. I have left harassing messages with my dear friend JK asking her to drop everything and call me but she isn't intimidated by my threats and will get around to it when she can. For some reason, I am not her top priority. Pray for fantastic scans! I am also very excited to tell you all about a project I am working on with Home Studio at Etsy. They make these fabulous pendants out of scrabble tiles and I fell in love when I discovered them. An idea for a Tuesday pendant popped into my head and I went to them and asked if they could do it. They were more than happy to oblige and even more generous by announcing they will have a 2 week sale where all purchasers who use the code Tuesday and buy ANYTHING from the site will have 10% of their total purchase amount go to Tuesday! So take a look at their store and start planning those purchases but don't buy anything until I give yo the go ahead. http://www.etsy.com/shop.php?user_id=5753249 . I think you will fall in love just as I did. I hope this fundraiser is a great success and a great excuse to buy some fantastic little trinkets! UPDATE: Scans are Thursday so pray, pray, pray! This year I realized a childhood dream. I became a member of the San Diego Zoological Society. I have always loved the San Diego Zoo and especially enjoyed the San Diego Wild Animal Park. The zoos are world class and their breeding programs for endangered species are spectacular. Best of all they provide the opportunity for children and adults to get up close and personal with animals they would otherwise never see while giving them an education on why every species is important and worth protecting. Or ecosystems are such delicate balances of life and one hole in the food chain can be catastrophic. But this isn't meant to be lecture on conservation. 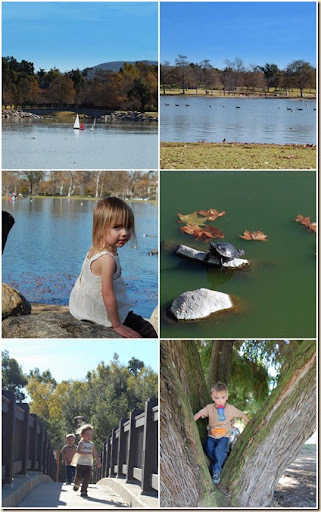 This is a post on why you should grab your kids and get to the zoo! My mom and I took the kids on a lovely fall day in January (fall in January? Yes! Or so it seemed). The weather was perfect for walking around the massive, hilly zoo without breaking too much of a sweat. The animals seemed to be enjoying the weather as well because they were out in full force! The gorillas came right up to the glass and were interacting with the guests. The orangutans were putting on a fabulous show during feeding time (Unfortunately so was Ben. Nothing like a massive tantrum in front of 40 people and a troop of Orangutans.I should also mention that Ben was most fascinated by the electrical outlets the zoo had in ground. I swear that boy is a piece of work) We got to catch a rare glimpse of the the snow leopard, an animal almost never seen in the wild. The river otters were basking in the sun and the polar bear was doing his best to make you believe he was a cuddly snuggle bear instead of a killing machine. We saw a duck with a blue bill and flamingos with bright pink foliage (did you know flamingos are pink because of the shrimp that they eat). The panda bear decided to climb up high in the trees to take in the view (according to the docent this was a first for this panda). My favorite part of the day was when we got to see the baby koala cuddled up and snuggling with its mama. I swear it was one of the cutest things I had ever seen. This weekend was Koalapalooza in honor of the baby koala. They had a number of Australian themed activities and a name the baby koala contest. It seems there is always something special happening at the zoo. The new Elephant Odyssey exhibit will be opening in the late spring. According to the Zoonooz Magazine, "Elephant Odyssey will take you on a journey through time, from when mammoths and saber-toothed cats roamed Southern California to their relatives and counterparts living today." I can't wait! The San Diego Zoo is a perfect example of what all zoos should strive to be. Fantastic exhibits full of enrichment for the animals, activities and education for the visitors, and hope for the so many endangered species that might not otherwise have a chance. Lately with all the warm weather the kids and I have been park scouting fools. There are just so many parks out there, waiting to be explored. It is fun to see all the new innovations in all things playground related. Most have swings and slides but some have something different. Something exciting and new. Northwood Park in Irvine is no exception. The standout at Northwood is the castle. Its a fortress around the playground where kids can climb the stairs to the top and play chase or princess in distress. Ben loved rolling his ball along the castle floor and chasing it. Mari just loved running its length over and over again. The entire upper portion has a safety gate around it except for a small opening for a fire pole so you can feel safe having your kids play up high and they can feel so big with their view of the entire playground. In addition to the castle there are a bunch of play structures clustered together, each aimed at a different age range. The area around the play structures is mostly covered in that rubber stuff but there is also plenty of sand for the kids to play in as well. There is a multi use room, bathrooms, ball fields, and even a handball court so you can bring your rubber ball and relive you elementary school glory days. There are also picnic tales and barbeque pits. Northwood would be a great place for an afternoon picnic. Overall I give this park two thumbs up. My kids loved it and I know we will be back. 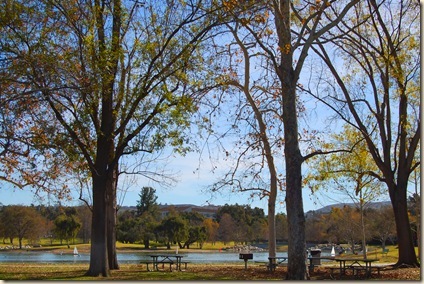 Yet another great example of an Orange County park! I have lived in California pretty much all my life. 18 of those years I lived in Southern California. Now you would think in all that time maybe, just maybe I would have been to the Santa Monica Pier. But no. Never. So on a recent trip to see my brother's new baby kitten Sofia Cheetara (do you like the Thundercats reference? ), I made the executive decision to have lunch at the pier. There is just something quintessentially LA about the Santa Monica Pier. Maybe its the beach that is so wide that it seems to stretch on forever. Or perhaps it is the vendor trying to sell you a picture of yourself next to a cardboard cutout of your favorite star. It could even be the family wearing matching Mexican ponchos that are way too small for them which they probably purchased earlier in the day at Olvera Street. Or maybe it is all of those things combined. The day we went was cold and dreary but I can just imagine the beach full of bikini clad girls and middle aged fat European men in speedos come summer. It isn't as big as I thought it would be. Certainly no Santa Cruz Boardwalk but there is a charm to it. Carnival rides, souvenir shops, and locals trying to cast a line and get lucky. Not a bad place to spend the afternoon. PS- Anyone know what movie this is from???? Have you ever driven through a blizzard while giving your daughter IV chemo on your way to her daily radiation appointment? Tuesday's mom has. Tuesday is home and happy to be there. She does spend half days at the hospital going under anesthesia to get her daily dose of radiation. She is walking again and off the morphine which means her pain is improving. This leads us all to believe the tumor is shrinking. She has radiation through the week and then more scans. The scan results determine what the next part of the plan is. Pray for great scans. Pray for a clear plan. Pray for a cure. 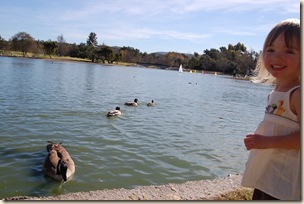 There is nothing like a good duck feeding. It always starts out innocent enough with a few ducks looking for a nibble of stale bread. Then slowly all the birds in a 5 mile radius start showing up for a little crumb action and you have chaos on your hands. Part of you is excited as the brave ones start inching closer. You want to see if they will eat out of your hand but the intelligent part of your brain takes over and you realize the bigger concern is whether or not they will eat your hand. You start noticing the hierarchy amongst the water fowl. You choose your favorites to toss to. Maybe its the one with the flashy feathers. Or maybe its the scrawny one who looks like he gets picked on all the time. Personally I favor the scrawny but I also discriminate based on species. I hate seagulls. So I try not to let them get a crumb. They are just scavenging flying rats whose main goal in life is to poop on my head. I do, however, love Canadian geese. I always make sure they are well fed. They have a long journey to make in a couple months and I want to make sure they are nice and fat for the trip back north. Mari and Ben didn't seem to have any particular method to their crumb throwing madness. They were just happy to be a part of it all. 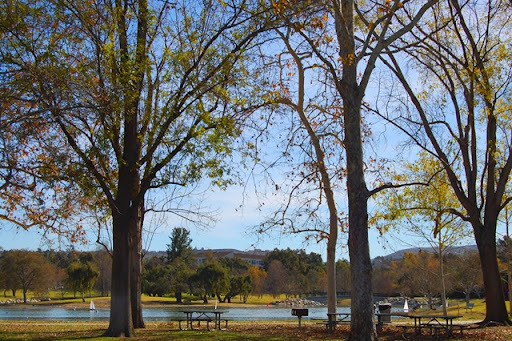 Mason Regional Park is another one of those wonderful places you can go to escape the concrete jungle and enjoy a little nature. Its located in Irvine, near UCI on University and Culver. Its centerpiece is a 9 acre lake filled with ducks, geese, turtles, and fish. While no human contact with the water is allowed, there is a very active community of model sailboaters. It is so pretty to see the remote control sailboats silently glide across the water. There are tons of picnic areas, a softball field, hiking and bicycling trails, two sand volleyball courts, a physical fitness course, and three playgrounds. We ended up spending time at one of the smaller playgrounds but there is a really cool blue fish themed one that has our name on it for next time. 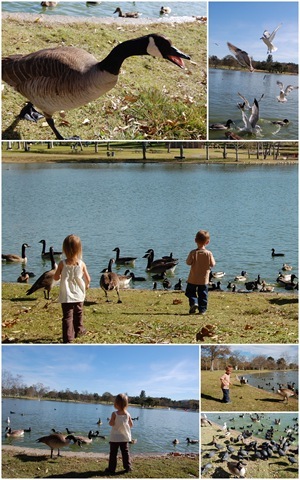 The great thing about this park is that the kids can do some walking, nature loving, and playing all in the same outing. The grounds are just beautiful with trees, water, and beautiful bridges everywhere. We went on an 80 degree day in January and the trees were still in the process of shedding their fall leaves. Poor confused South Orange County trees. It made for some wonderful scenery but I do feel bad for them. You do have to pay to enter the park ($3) but considering it is set back away from traffic which is a big plus for a mom who is trying to watch two little ones, it is very worth it. When you consider $3 will give you hours of entertainment and also help keep this marvelous urban park in great condition, it is quite the bargain. So watch out ducks, I have more stale bread with your name on it (this does not involve you seagulls!). 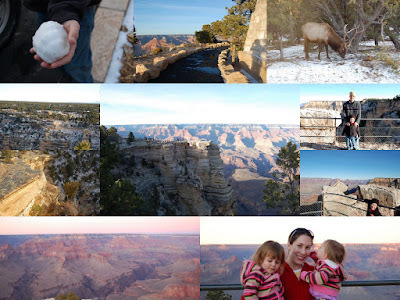 Four Arizona National Parks, Plus a Trip to the North Pole! 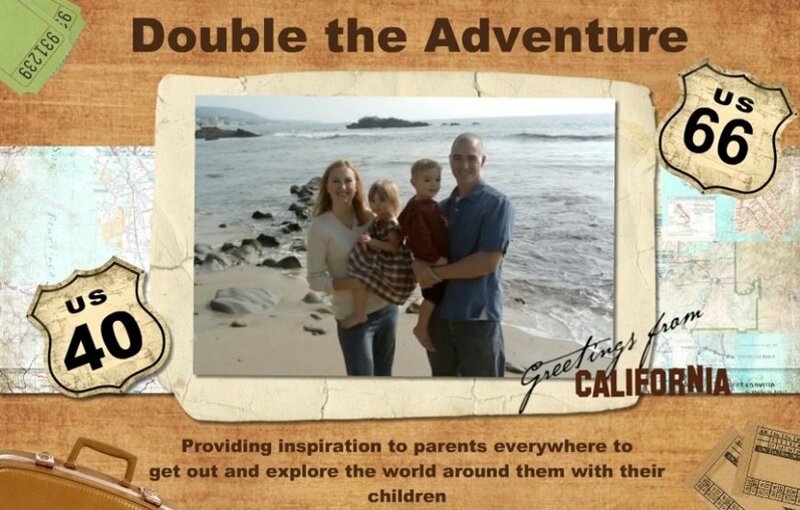 Today's guest post is being done by my friend and fellow twin wrangler, Shannon B. Shannon is a mother of 3 and military wife. In other words, she's superwoman. Recently, her family took a trip to the Grand Canyon, the Polar Express Train, the Petrified Forest, and a couple National Monuments. 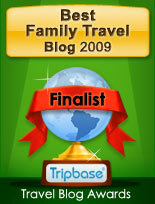 I am completely jealous of their trip and thought it would be a wonderful story to share with you. Once again proving that getting out and exploring the country is such a fun and rewarding thing to do with your kids! Enjoy! Some people think its crazy to attempt camping and long road trips with young children. I say, why wouldn't you want to experience these things with your kids? We are a military family after all, so we are highly motivated to take full advantage of the regions we live in because we can never be sure how long we will be in one area. We would be kicking ourselves if we lived on the West Coast all this time and never saw Yosemite National Park, or explored all the nearby beaches, or even traveled to Arizona to see the Grand Canyon. We have done all of those things (and more), but most recently was our trip to Arizona in December. The idea for this trip originated from an email I received from a friend last summer, about the Polar Express train trip that is put on by the Grand Canyon Railroad each year at Christmas-time. It is a very sweet re-enactment of the book, The Polar Express by Chris Van Allsburg. The train goes to “The North Pole”, and then Santa gets on the train to briefly greet the kids and give each of them a special gift. We thought this would be a wonderful surprise for our 5-year-old son Luke, and while our girls (twin 2-year-olds, Dana & Brynn) wouldn’t really remember it, they were sure to have fun as well. We decided to stay in Williams, AZ, since that’s where the train depot is. Williams is about 60 miles south of the Grand Canyon, so we knew we had to include that in our plans as well. We also wanted to try and explore other national parks and/or monuments nearby, but made no other specific plans for those since, with small children in tow, you have to be flexible. We left southern California on a Monday (camped overnight in a KOA in Needles, CA), and got to Williams on Tuesday. Yes, it took two days to get there---pulling a 28-ft camper/trailer and traveling with young children takes longer than usual! We also chose a KOA in Williams, because those tend to be the easiest to stay at when traveling with children. When the kids are older, we’ll “rough it” more, but for now its nice to have certain amenities that places like KOA offers (playgrounds, bathrooms & showers, etc.). The train ride wasn’t until Wednesday, so we had most of Tuesday afternoon to check out Grand Canyon National Park. We didn’t go to there with intentions of doing any big hikes because honestly, we had no desire to try and hike down into the canyon with our three small kids. Too many hazards to consider, and it would just take way too long for us to get down there. And then we’d have to hike back up---most likely in the dark since the shorter, winter days are here. Plus, it was COLD. About 30 degrees when we got there, so there was no way we’d do that sort of thing this time. So we stuck to the driving tour, which fortunately for us, was fully accessible by car. By going in December, the whole South Rim road was open to drive on, whereas Mar. 1--Nov. 30, you have to take a shuttle if you want to go past Grand Canyon Village. We were also lucky to have been there in the afternoon because we caught a spectacular Grand Canyon sunset, plus an almost full moon rising. Even though we didn’t do any major hikes, we definitely feel that we got a good first Grand Canyon experience with the kids (my husband and I had been there before kids) by just driving and stopping to make short hikes at the turn-off points. There were no crowds, and we even had up-close wildlife sightings of deer and elk at a few points along the road. The animals seemed to be used to all the people around, but as always you don’t want to get too close. I saw one bold photographer do this, and he almost got charged by an elk. Luke & the girls were fascinated by these impressive animals, and it was especially exciting for these SoCal kids to see snow! It was finally Wednesday, the day of our Polar Express train ride. But, that didn’t start until 6:30pm, so we had the whole day to fill with other adventures. So we packed our cooler with enough food & drinks to last through the afternoon, and drove northeast of Flagstaff, AZ to Sunset Crater Volcano National Monument and Wupatki National Monument. We did a mostly driving tour of Sunset Crater (which last erupted in 1064-65), and enjoyed the beautiful scenery of meadows, lava flows, and cinder dunes. The Loop Road is about 36 miles long, and continues through to Wupatki National Monument. We got to stretch our legs a lot more while exploring the remains of masonry pueblos at Wupatki. 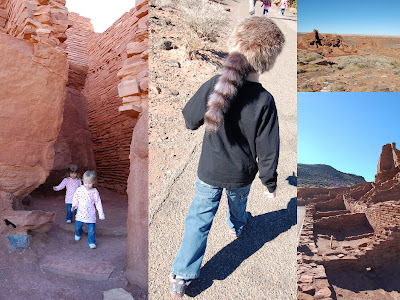 We started at a 0.5-mile loop trail behind the Wupatki Visitor Center (a great little mini-museum with kid-friendly, hands-on exhibits), which leads to the Wupatki Pueblo. The pueblo was built by ancestors of today’s Hopi and Zuni Indians in the 1100s. The kids loved running around on the trail and even got to play in and around some of the buildings. But we were careful to remind them (especially Luke, our budding Indiana Jones) that anything he picked up must be put back exactly where he found it! The ranger who was working that day was very friendly and even showed Luke a spot where it was common to find small shards of Indian pottery---and even let Luke hold some of it. To say that my son was impressed is an understatement! 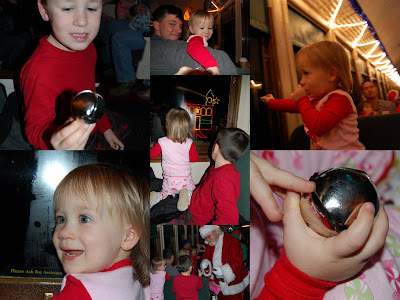 Before we knew it, we needed to head back to Williams to eat dinner, get the kids dressed in their Christmas pajamas, and then get ourselves to the train depot for our departure to the North Pole! As I said before, this was to be a surprise for Luke, so he had no idea where we were going until we got to the train station. He didn’t believe us at first, and then was a little worried that we were sending him on the train to see Santa on his own (like the boy in the book). Once he realized we were all going, he started to get really excited. The train trip was everything we had imagined and wanted for our kids. The train itself was beautiful and impressive---it felt luxurious, not like your modern-day Amtrak ride! The ride was also well-organized. Relaxed. Magical. We were treated to hot chocolate and cookies on the ride to the “North Pole”. Then one of the “elves” read The Polar Express story to the children, going around and showing each page as they read. Note to self: if we do this again, bring our copy of the book so we can read along! When arriving at the North Pole, you never get off the train. The “North Pole” is meant to be seen from the windows of the train. The kids all marveled at the festive lights, and then they spotted Santa and his sleigh (packed with a GIANT sack of toys! ), which was parked in front of the little village setting. He waved at us as the train slowly passed by. Then we stopped. After a few minutes, the train started backing up, and Santa was no longer outside waving at us! Hmmm, where did he go? They informed us that Santa had gotten on the train (audible, excited gasps from the children could be heard throughout the train car at this news! ), and to be patient since he had several train cars full of children to greet. It didn’t actually seem to take that long, because they did a pretty good job of distracting the kids with Christmas carol sing-alongs (they even passed out a songbook so the parents could help sing along too). Then Santa appeared and the kids were all just buzzing with excitement. He made his way to where we were sitting and Luke was sweet, polite, and in awe of this friendly, authentic-looking Santa who was standing before him. Santa handed him a large, silver sleigh bell. He then handed one to Brynn, who immediately (and expectedly) shrunk into me, and he gave me another one for Dana, who had fallen asleep. My husband Will was up and ready to capture a quick photo of this sweet moment. As Santa made his way through the rest of the train cars, we enjoyed the rest of the ride back to the train depot where he stayed for a little while for more formal photo opportunities. 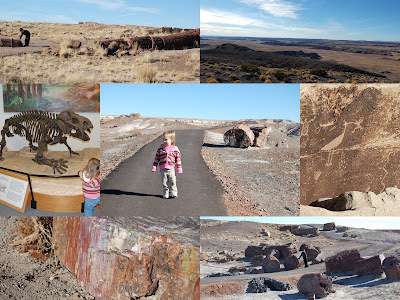 We decided that even though it was a long drive (about 2 hours each way) from Williams, that we just couldn’t leave AZ the next day without visiting Petrified Forest National Park. Will went there when he was a child, but I had never been. So, again, we packed food, movies for the kids to watch in the car, and away we went. This park had the most kid-friendly hikes of all the parks we visited on this trip. Most were easy, not too many hills to climb, and were just long enough for the kids to release their pent-up energy from being in the car for so long! There is a great visitor center at the southern end of the park, called the Rainbow Forest Museum. They have exhibits there about petrified wood, geology, and paleontology. The dinosaur skeletons & fossils were the highlight of the museum, according to Luke! We started our first hike in the park from the museum, on the easy 0.4-mile paved (with some stairs) Giant Logs Trail. Then after eating our picnic lunch, we moved on to another easy hike, the 0.8-mile paved Crystal Forest Trail, probably our favorite hike in the park. We still had to remind our son (several times!) that he could absolutely NOT keep any of the rocks he found there on the trails. There are so many tiny “wood chips” that may be tempting to keep, but it is against the law to take anything from the park. But there are places outside the park where pieces of petrified trees (mined from nearby sites outside the park) can be purchased if you want them for a souvenir. Before leaving the park, we also stopped at other sites that show evidence of early human occupation, such as the remaining foundation of Puerco Pueblo, and petroglyphs (found at Newspaper Rock and Puerco Pueblo). I was truly surprised by the stark beauty of this place. I’m not sure what I expected before we got there, but was just stunned by how time, wind, and water have shaped this place over millions and millions of years. It is amazing to think that this region was once a floodplain, full of tall conifer trees (now fallen and petrified!) instead of a dry grassland/desert. And to be able to see and touch those ancient trees that had transformed into stone was just amazing. During our travels that week, we were surrounded by another wonder of the American southwest: The Painted Desert. We could see gorgeous vistas of it from Sunset Crater, Wupatki, and also from the Petrified Forest NP. Before we made the 2-hr drive back to Williams, we did go into the Painted Desert Visitor Center. We had to get our National Parks Passport book stamped (boy that thing is filling up in the Western Region lately! ), and also drove around a short loop there which had several turnouts with great viewpoints for taking photos. Perhaps for another trip we would research some desert hikes to explore it further. We had a wonderful time on this trip, even if it was just a quick one. We feel very lucky to be able to take advantage of travel opportunities wherever my husband is stationed. It does take a bit of extra work & planning to take young children along on these adventures, but the great memories we are making are worth it. And even if you aren’t a military family who doesn’t know how long you’ll have to explore your area, it may help to have that “temporary” mindset. Because if you keep putting it off because it’ll always be there, it may just never happen! Lets face it, Orange County is crowded. Some days it seems like an endless expanse of people, cars, houses, and shopping centers. When I start to feel suffocated by the masses so I like to take a drive. I head to the ocean where I can look out and see nothing but blue. It calms my soul and it renews my energy. Other times I need something different. I crave a place full of wildlife, trees, and rugged wilderness. Looking at what surrounds me, I wouldn't think I could find a place like this within fifteen minutes of my house. But I can. That place is O'Neill Regional Park. O'Neill is back in Trabuco Canyon, just east of Lake Forest, Mission Viejo, and Rancho Santa Margarita. It is so close to that endless sea of humanity yet feels like it is miles away. Its Orange County as it used to be. Before their were shopping centers and subdivisions there were ranchos filled with oak trees, chaparral, cactus and rocky canyons carved out by seasonal streams. O'Neill is a wonderful reminder of the Orange County of the past. There is plenty of room to hike, camp, and enjoy the great outdoors. 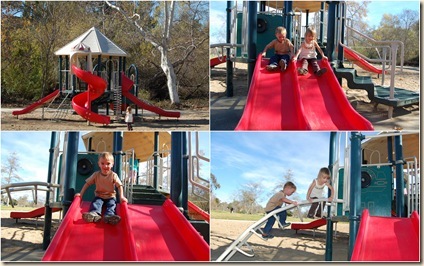 It is also a great place to take the kids to the playground! O'Neill has a wonderful play area and nature center (open on weekends) just within park boundaries. 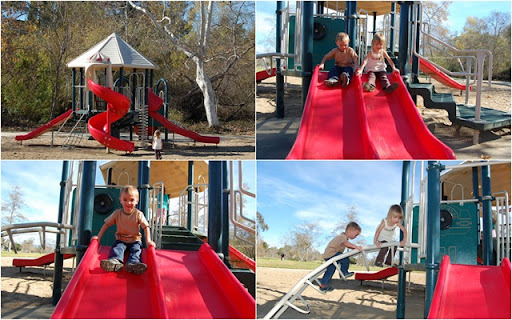 I love this playground because not only is it surrounded by the beauty of nature, it also educates children about animal tracks, Orange County ranchos and landmarks, animals, and how to tell time using the sun by placing the information directly into the design of the play structures. Adjacent to the play area is the Tot's Trail. Its a short loop in a grove of oak trees with information plaques on the local wildlife dispersed throughout the trail. Little ones can learn to identify different animals and older kids can learn some fun facts. The kids and I wandered down the creek bed that runs through the park and enjoyed the scenery. There is a campground nearby that looks like the perfect spot for us to do a camping test run before we take an overnight trip someplace that isn't a quick drive to the comforts of home if disaster strikes. Our final stop was the Mesa Overlook area. It is a lovely spot to have a picnic and take in the views. A week ago, Tuesday was in so much pain that she screamed all day and night and would not even let her mother touch her. Last weekend she was feeling good enough to have a visit with her siblings. Today she is doing well enough to have great shot at being discharged on Thursday. Yes, she still has cancer. Yes, she still has to have radiation and chemo coursing through her veins because she has a rapidly growing tumor inside of her. But today she is feeling better than she was a week ago. She is going back uphill. Tuesday is the warrior in this battle but we all share her victories. And we all look forward to many more. What did you do on New Years day? Did you watch the Rose Parade? Some bowl games? Maybe nurse a hang over? Well guess what we did? We took a hike! The weather was perfect and nature was calling. We had just had a big storm over Christmas so the water was flowing from the mountains. A perfect time for a stream side hike to a waterfall. Holy Jim Falls was close by and highly rated on Localhikes.com so I figured it was the perfect hike to take. Holy Jim Falls is located in the Cleveland National Forest back in Trabuco Canyon. Driving there is an adventure in itself. Its only about 15 miles off I5 but the last 5 miles of the drive are on a very bumpy dirt road. If you go after alot of rain it is also a puddle filled and wet with some small stream crossings. I personally wouldn't do this drive in a compact 2WD vehicle (though quite a few people do) but if you have an SUV or truck, its a blast. Sure your car will be a filthy mess but you finally get to do some off-roading in a vehicle made to off road. Please also note that you will need an Adventure Pass to park on the National Forest land (we purchased ours at Sports Chalet a couple days earlier. Click on this link to see the closest place to get yours) Once you get to the falls parking area, you start out up a dirt road lined with cabins. I looked at those cabins with envy. Holy Jim Canyon is certainly a great place to have a vacation home. After about a half mile or so you will reach the trail head for Holy Jim Falls. This is an easy trail but after heavy rains you have to do some stream crossing. We did just fine crossing the stream with our two year old twins. There are rocks or trees to walk on to avoid getting wet (unless you think you are stepping on a rock and instead you step on a leaf and get a shoe full of water). The path has plenty of shade and mostly follows the creek. The canyons that surround you are so rugged and steep that you have to crane your neck to see the tops. The hike itself should only take a couple hours but with small children who love to stop at every creek crossing and throw rocks into the water, it is an all day event. I pushed us to reach the waterfall because I felt like we needed to make it to the end but honestly, its nothing to write home about. Sure its pretty but I think the journey there is just as pretty. So don't sweat it if your little ones want to call it quits a little early. Since this is a single track trail, it is not stroller friendly for much of the way. It is very kid friendly and I think its the perfect place for all ages because it isn't difficult but it is fulfilling for everyone involved. There is only a slight incline on the way to the falls and most of the trip back to the car is downhill so you will find yourself making it back in no time. Highlights of our hike included Mari reminding us no less than 50 times that "dacus is a ow" (translation cactus hurt if you touch them so don't touch them), Ben throwing enough rocks into the stream to probably permanently alter its route, the trail tunneling under a large bush, and Paul doing the Karate Kid pose and almost falling off the log into the stream. I would certainly do this hike again. Locals should try to make it out next time we have big rain. Out of towners should consider taking a side trip next time you plan that Disney vacation. I mean honestly, how many days of Mickey, crowds and concrete can you take before you just ache for a little bit of nature?